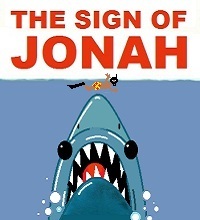 The sign of Jonah. The flooding of Mosul shows Jesus is Israel's Messiah! The destruction of Mosul may be the end time sign of Israel’s time of trouble. On July 24th 2014 ISIS blew up the shrine to Jonah in Nineveh. Folks wanted proof that Jesus was God so they demanded a sign. Jesus gave them the sign of Jonah. Just as Jonah was inside of the fish for three days Jesus also rose from the grave in three days. But there may be more to the sign of Jonah. Long before the Mosul dam was ever built Bible scholars have wondered if the preaching of Jonah was also a part of the sign. The grammar of Matthew 12:39-41 leads some Bible scholars to think that the subject of Jesus’s comment was the preaching of Jonah. The unbelieving religious rulers in Jerusalem demanded a sign from Jesus. Jesus told them that they would not be be given a sign except for the sign of Jonah. Jonah was sent to ancient Nineveh to tell them to repent because God’s judgment was coming on the city. The destruction of Mosul could be the end time sign to Israel that Jesus is indeed their God and that their time of trouble is at hand. Perhaps this generation will repent at the preaching of Jonah when Mosul is flooded! If Israel repents at the preaching of Jonah then they will narrowly escape God’s coming judgement on the city of Jerusalem and on the nation of Israel. Jesus said that even the men of ancient Nineveh will rise from the dead and condemn his generation for its unbelief. It seems to me that this generation is about to witness another sign of Jonah. ISIS in the city of Mosul rejected Jonah’s offer of repentance by blowing up Jonah’s shrine. A terrible time of God’s judgment is coming upon Israel and also upon all of the earth. Only by repentance from unbelief can we escape it. I suspect that the Prophet Nahum describes the fall of ancient Nineveh as well as the demise of modern day Mosul. I think that Mosul will fall soon by a flood and by the same three armies that wiped out Nineveh. Since I wrote this I have learned that the dam just north of Mosul is very unstable and requires continuous maintenance. The capture of the dam by ISIS and the recapture of the dam by the Kurds has disrupted its maintenance schedule. In 2007 the Army Corp of Engineers declared it the most dangerous dam in the world. If Mosul falls I will count back forty days to see what significant event may have happened on that day. The sign of Jonah – The flooding of Mosul proves that Jesus is Israel’s Messiah! Hi We could also interpret the “flood” of Mosul as being over run by an army – currently happening at the minute !! The word ‘flood’ means a ‘military invasion, attack or war.’ One example of this symbol is in Revelation 12:15 where the serpent“…spewed water out of his mouth like a flood after the woman,” so the interpretation of this is, ‘Satan sends an army to attack the fleeing Jews. From website A biblical study of 666. Hi Pat. You are a good bible student. A flood often refers to an invading army in the bible. In Nahum it refers to a flood of water because this prophecy has already been fulfilled in 612 B C by the overflowing of the Tigris River and the actual flooding of the city of Nineveh. I think that Nahum may also describe the flooding of Mosul. That’s awesome Craig, what if just like during the generation of Jesus Christ, all the unbelievers during this generation will get the sign of Jonah, after the third day, as in millennium we will all be raptured. Jesus was resurrected after three days but ascended after forty days!